Texas Trust Credit Union was created in 1936 when a group of Chance Vought Aircraft Corporation employees pooled their savings so they could help each other achieve financial goals. Today, more than 118,000 members are served through checking and savings accounts; loans (personal, mortgage, auto, and small business); credit cards; insurance products; and investment services. Texas Trust Credit Union supports local students through its “Spirit Debit Rewards” program. With every eligible swipe of an SDR card, funds are donated to the school or district of the member’s choosing. To date, Texas Trust has donated more than $1.8 million since August 2011. Texas Trust serves members through 21 locations in Dallas, Denton, Tarrant, Henderson, Ellis, Johnson and Tom Green counties. 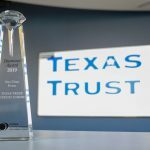 With assets of more than $1.2 billion, Texas Trust is the 6th largest credit union in North Texas, the 17th largest in Texas, and was ranked the 10th best performing credit union in the country by Standard and Poor’s Global Market Intelligence. For more information, visit TexasTrustCU.org or follow us on facebook.com/texastrustcu or Twitter at @texastrustcu.